A big piece of ethereum’s decentralized “world computer” will be launching its first public testnet in the coming weeks. With the launch of the Swarm testnet, the network will be open for any developer to test the new file storage system and identify and fix potential issues. Developers can also use any ethereum client (whether geth, parity or the python client) for their work. According to developers involved, the move that takes the project one (small) step closer to making its full vision a reality. On the Internet today, centralized servers owned by for-profit companies hold most of the world’s data. But Swarm wants to shake this up by building on an old idea – file sharing. You might be familiar with BitTorrent, a similar way of file sharing over a peer-to-peer network. The problem with the network, according to the Swarm team, is that it relies on the generosity of its users, that and it’s too slow to use as the base for a new web. 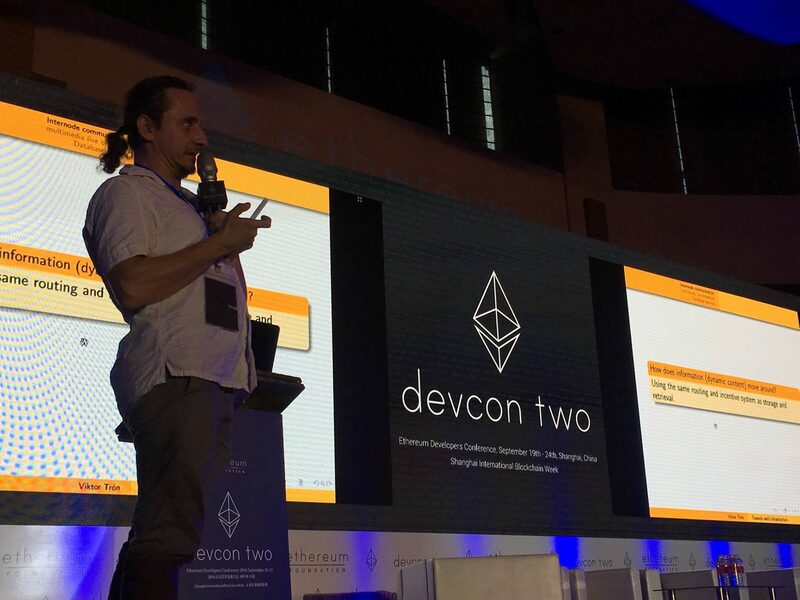 The updates were part of a talk at the ethereum developer conference Devcon2 today, entitled “Swap, Swear and Swindle. Swarm Incentivization”, given by its team leads, Trón and Aron Fischer. Decentralized versions of photo albums, file managers, corporate storage platforms and GitHub are a few ambitious examples for how Swarm could come to be used. So, how exactly does this fit into ethereum’s “world computer” idea? The big picture vision is to use ethereum’s “holy trinity,” as Trón called ethereum, Swarm and a messaging system called Whisper, to build the low-level groundwork for this new World Wide Web. Ethereum already puts the computational part into place, but it provides limited space. Swarm adds a storage layer to the system. Essentially, it remains too costly to store everything on a blockchain. In this way, Swarm allows data to be referenced on a blockchain, but stored elsewhere. Yet, in the talk, the developers indicated that incentivizing a file sharing network remains a work in progress. As noted in the presentation, Swarm enables content to be retrieved, but there is no guarantee it will be available. Trón outlined how Swarm is seeking to create a system based on what he called “proof of custody”, one whereby users would commit a payment to store data, which could be paid incrementally to the person storing it. “The proof of custody construct makes it so actually you could have a very good level of security that your content is being stored by the storer,” he said. Swarm then uses a “judge contract”, a smart contract that would ensure that the data won’t be paid if what they have agreed to watch goes missing. However, Swarm also needs a system to ensure that the users storing its data are penalized if they break a promise. This is where a “Swear contract” comes in, as the smart contract allows nodes to register by posting a security deposit. Registered nodes, the developers explain, can sell promissory notes guaranteeing long-term data availability, which would be exchanged for receipts. If the data that is overseen by the contract is lost, a feature called a “Swindle” contract comes in. Should a user with a receipt find that their data is no longer available, they are allowed to start a process Fischer likened to litigation. Here, Tron used the analogy of a babysitter to set the scene for the stakes involved in the high-tech dispute. “Once it gets to this stage, the only way a peer can defend themselves against a challenge is to say, ‘Your baby is here, it’s OK’,” Tron explained. But if it all goes according to plan, users will have a similarly easy experience using Swarm. Of note is that Web 3.0 isn’t a term that ethereum owns, rather it’s a concept that its developers are rallying around. Trón argues that the blockchain was the “missing puzzle piece” to making this reality and that there are “no more excuses” for big intermediaries (think Facebook or Google) to be the only companies able to provide Internet services. 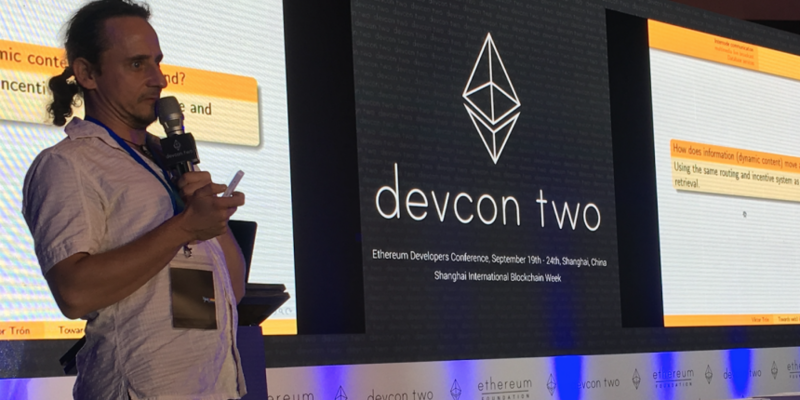 The second Swarm code proof-of-concept was released in May, and if all goes well, they say they will migrate the testnet to the official ethereum testnet, Morden. Trón said they already have plans for a third and fourth code proof-of-concepts, which will include more comprehensive internode communications, data streaming and decentralized database services.